That’s all from me. Bangladesh are doing a lap of honour around a ground that was never very full, but however many fans remain, these cricketers deserve to milk their acclaim. Now they need England to do them a favour tomorrow by beating Australia and helping them through to the semi-finals. There will, of course, be full coverage of that tomorrow. For now, though, bye! Incredible scenes! From 33-4, Mahmadullah and Shakib al Hasan produced two innings of fabulous pacing, concentration, judgement and quality to gradually and remorselessly drain all hope from New Zealand. Wonderful cricket. Bangladesh win by five wickets! 47.2 overs: Bangladesh 268-5 (Mahmadullah 106, Mosaddek 7) Milne’s second ball is edged hard, fast and safe, racing away for four, and the game is won! 47th over: Bangladesh 264-5 (Mahmadullah 106, Mosaddek 3) Shakib backs away, Boult aims at his backtracking legs, and the ball gets pushed down the ground for four anyway. The batsman gives himself some space again from the next, and heaves it away for four more! These are killer blows, surely, even if the following delivery ends Shakib’s knock. Mosaddek comes in and sends his first two balls down to third man. Mahmadullah faces the last, and with six needed it might be his only chance to complete his century. So he doesn’t hold back: he swings hard, the ball flies high, and it lands a foot short of the rope and bounces over! Bangladesh need two runs, from 18 balls. Shakib wants to end this in a hurry, but he heaves at a straight one, misses it completely and the bails light up. He deserved to finish this, but is nevertheless roared from the field, a hero. 46th over: Bangladesh 249-4 (Shakib 106, Mahmadullah 98) With two centuries just a few steps away, these are nervous times. The over starts slow: dot, single, dot, leg bye. Then Shakib pulls the ball high and fine – in all senses – down the leg side for six, to reach his century! Bangladesh need 17 runs from 24 balls! 45th over: Bangladesh 240-4 (Shakib 98, Mahmadullah 98) For a while it looks like Bangladesh will be content to milk Boult’s ninth over for singles. But then Shakib violently hammers the ball over long off for four, which puts paid to that. He swings at the next one as well, less – or rather, not at all – successfully. And the one after that, again without making contact. More haste, less speed and all that. A single off the last and the two batsmen are tied on 98 runs apiece, and their team need 26 from 30 deliveries. 44th over: Bangladesh 232-4 (Shakib 92, Mahmadullah 97) Neesham returns, Williamson shuffles his field so as to reveal an imminent bumper, and Mahmadullah is ready for it, and brilliantly nudge/scoops it over Ronchi and away for four. That aside, it’s all singles. They need 34 from 36 balls. 43rd over: Bangladesh 225-4 (Shakib 90, Mahmadullah 92) If the wheels aren’t yet coming off this New Zealand Champions Trophy victory wagon, the radar is certainly wobbling. Southee starts his ninth over with a wide, and then continues with another one. Then Shakib gets a single with the latest of late cut, a cut that if it were a fraction of a moment later would have come after the ball had already clattered into the stumps, causing all sorts of frustration/relief, depending. The next is a fabulous yorker, which Mahmadullah just survives, killing the ball, stealing a sharp single and giving Shakib the chance to clobber Southee’s fifth/seventh delivery of the over through the covers for four. Bangladesh need 41 from 42 balls. 42nd over: Bangladesh 215-4 (Shakib 84, Mahmadullah 90) This is now Bangladesh’s highest-ever ODI partnership. The first ball of Santner’s over is brutally dismissed down the ground by Mahmadullah for four. A wide later, he turns the ball gently to an giant gap in midwicket and runs two, and is so pleased with himself he does it again. Then, a moment of weakness, cutting the ball in the air straight to backward point, but it bounces a foot before the fielder. What a fabulous partnership this has already been for Bangladesh, and at the most crucial of times. 41st over: Bangladesh 205-4 (Shakib 84, Mahmadullah 81) Can the returning Southee do with the old ball what he did so spectacularly with its younger self? Not on this evidence: Shakib shuffles forward, leans backwards and slaps the ball wide of cover for four, and then tries to smash the next for six, doesn’t get enough on it and is fortunate to see it land well short of the fielder. Then Mahmadullah absolutely clobbers the last, but sends it straight to a fielder and gets only a single for his pains. 40th over: Bangladesh 196-4 (Shakib 79, Mahmadullah 77) Santner bowls a ninth over, and Bangladesh largely restrict themselves to prods, nudges and nurdles for ones and twos. Six from the over. 39th over: Bangladesh 190-4 (Shakib 76, Mahmadullah 74) Milne’s over yields but three runs. Bangladesh need 76 from 66 at 6.90 an over. New Zealand were 201-4 at this point with calamity yet to strike. 38th over: Bangladesh 186-4 (Shakib 75, Mahmadullah 73) There’s a tiny crowd in Cardiff, but the tension they’re feeling is starting to transmit itself across the miniature excuse for a TV that’s lurking in the top corner of my computer screen. 37th over: Bangladesh 183-4 (Shakib 73, Mahmadullah 71) Mahmadullah swings a little wildly, top-edges way into the air but also, handily, quite a bit behind him, and it bounces once before vaulting the rope. Milne’s next delivery cuts into the batsman, zips through the gate and high of the stumps, a fine comeback, and then the next is steered skywards past point, where Guptill dives, grasps and comes back with fresh air. The win predictor, which once rated New Zealand’s chances of victory at 84%, now suggests they’re on the right side of a 51-49 split. 36th over: Bangladesh 173-4 (Shakib 71, Mahmadullah 64) Shakib doesn’t look happy about life. He seems to be tired, and is conveying this by frequent sad looks at balconies, occasionally while stretching, feeling or rubbing some ailing body part. Still, he battles on bravely. 35th over: Bangladesh 169-4 (Shakib 68, Mahmadullah 63) Fifteen overs to go, and this game is now very finely poised. Bangladesh score six runs from Boult’s eighth over, and need just keep going at a similar pace, while not really losing any wickets if they can help it. Simple. 34th over: Bangladesh 163-4 (Shakib 65, Mahmadullah 61) That was indeed the last we’ll see of Williamson. Santner comes back with three dots, followed by three ones. 33rd over: Bangladesh 160-4 (Shakib 64, Mahmadullah 59) And Boult slams the brakes back on again. Two singles, and a lovely yorker to finish with, which Shakib just about jams his bat down in the way of. 32nd over: Bangladesh 158-4 (Shakib 63, Mahmadullah 58) Blammo! Mahmadullah relocates the accelerator pedal, heaving the ball down the ground for six, and then Shakib straight down the ground for four. That may be Williamson’s last over for a while, and the required run rate is back to a precise and round six. 31st over: Bangladesh 145-4 (Shakib 57, Mahmadullah 51) Boult is back, and Mahmadullah guides the ball down to third man for a couple to bring up his half-century. It’s been a really fine knock, though it’s slowed down a bit after a speedy start. New Zealand are now huddling, and trying to work out how to get rid of one or both of this pair. 30th over: Bangladesh 139-4 (Shakib 55, Mahmadullah 47) There’s a delay in the middle of Kane Williamson’s first over while Shakib gets some finger-cramp dealt with, and then when he finally does heave his gloves back on, he guides the very next ball expertly wide of extra cover for a couple. 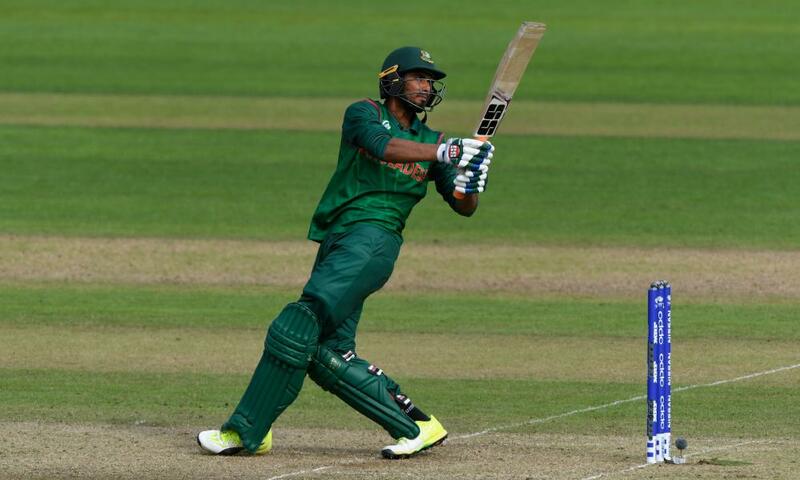 29th over: Bangladesh 133-4 (Shakib 50, Mahmadullah 46) These batsmen have successfully turned 33-4 into 133-4. New Zealand were 148-2 at this point, but their batting calamities were still to come. Shakib reaches his half-century, and celebrates it in the manner of someone who realises his previous celebration was a bit premature. 28th over: Bangladesh 130-4 (Shakib 49, Mahmadullah 45) Santner concedes a couple of singles before bowling one down the leg side that beats Ronchi and trundles off for five wides. Than Shakib scores a single that takes him to 49, an achievement he celebrates in the manner of someone who thinks he scored another run that nobody else is counting at some point. 27th over: Bangladesh 120-4 (Shakib 47, Mahmadullah 42) That’s nice from Mahmadullah, whose drive is so perfectly placed that it has one fielder diving to his right to stop it, and another one diving to his left, and neither gets so much as a touch. The Bangladesh fans in the Cardiff crowd, silenced by New Zealand’s opening wicket-capturing burst, are in full voice again now. 26th over: Bangladesh 111-4 (Shakib 47, Mahmadullah 41) Santner bowls. Two singles are scored. 25th over: Bangladesh 109-4 (Shakib 45, Mahmadullah 33) A short ball from Anderson, and Shakib slaps it down into the ground and away for four wider of long on. The next is edged, but safe. I’m not sure if I’m finding this game’s longueurs testing because I was up until muchtoolate o’clock watching election results and would find anything testing as a result, or if they’re authentically testing. For now, they get the benefit of the doubt. 24th over: Bangladesh 104-4 (Shakib 40, Mahmadullah 33) Mahmadullah tries to flick the ball over his left shoulder but instead top-edges it into his own face, thankfully helmet-protected. Shakib’s single off the first was the only run Santner conceded. 23rd over: Bangladesh 103-4 (Shakib 39, Mahmadullah 33) Mahmadullah pulls Anderson fine for four, and then the next goes square for a couple to tick Bangladesh’s tally into triple figures. Bangladesh 100-4 in the 23rd over. 21st over: Bangladesh 90-4 (Shakib 34, Mahmadullah 25) Corey Anderson gets in on the bowling act. The game is in an interesting stage, interesting mainly because this stage is temporary, could end at any time and because the stage before it and (presumably) the stage after it were and will be more interesting still. 20th over: Bangladesh 85-4 (Shakib 30, Mahmadullah 24) Mitchell Santner has a go at the bowling, and concedes three runs in a one and a two. These batsmen are looking settled now. Comfortable, even. 19th over: Bangladesh 82-4 (Shakib 29, Mahmadullah 23) Fireworks, you say? There’s a rocket – Mahmadullah advances to Neesham and clubs the ball over square leg for a big old six, and then he top-edges a pull, safe as houses, for four. 18th over: Bangladesh 69-4 (Shakib 27, Mahmadullah 12) A fine, unshowy drive from Shakib sends the ball trundling away for four, as the rebuilding continues in firework-free style. 17th over: Bangladesh 63-4 (Shakib 22, Mahmadullah 11) It’s all about stability now for Bangladesh. Not exactly strong, but stable will do for now. The run rate is rising slowly, but still a manageable 6.15. 16th over: Bangladesh 59-4 (Shakib 19, Mahmadullah 10) The sense of constant peril has dissipated somewhat, a bit like the post-Spielberg Jurassic Park movies. Shakib pulls Milne through midwicket for a handsome four. 15th over: Bangladesh 53-4 (Shakib 14, Mahmadullah 9) James Neesham comes on second change, and Shakib wins the race to double figures with a single, and then celebrates with a fine four through the covers. 14th over: Bangladesh 47-4 (Shakib 9, Mahmadullah 8) After three dots Shakib goes for a risky single and gets it only because Williamson’s shy at the stumps – just one of them, really, from where he was standing – slides just wide. 13th over: Bangladesh 44-4 (Shakib 8, Mahmadullah 6) Southee keeps going, and for the first time since over one he concedes a boundary, smacked through cover by Shakib. And another! Mahmadullah thumps the last over midwicket. The race to be the second Bangladeshi batsman to double figures is well and truly on. 12th over: Bangladesh 35-4 (Shakib 3, Mahmadullah 2) A bowling change, with Adam Milne coming on, and Mushfiqur clubbing a shortish delivery over the bowler’s head for four. Maybe he’s expecting another short one next up, but instead it goes full and the batsman is profoundly beaten by the change of length, and on his way. That’s a fine, full delivery from Milne, which cuts back through the gate and clobbers middle stump! 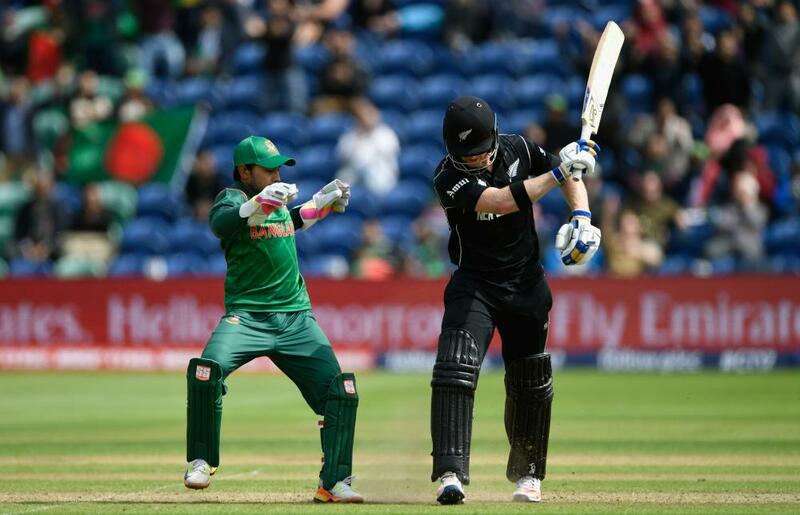 11th over: Bangladesh 28-3 (Mushfiqur 10, Shakib 3) The last 10 overs of New Zealand’s innings and the first 10 of Bangladesh’s brought 86 runs and seven wickets, the conditions transformed from the morning. This is the (joint) second most expensive over of the innings, though, Bangladesh plundering four off it. 10th over: Bangladesh 24-3 (Mushfiqur 8, Shakib 2) Dropped! 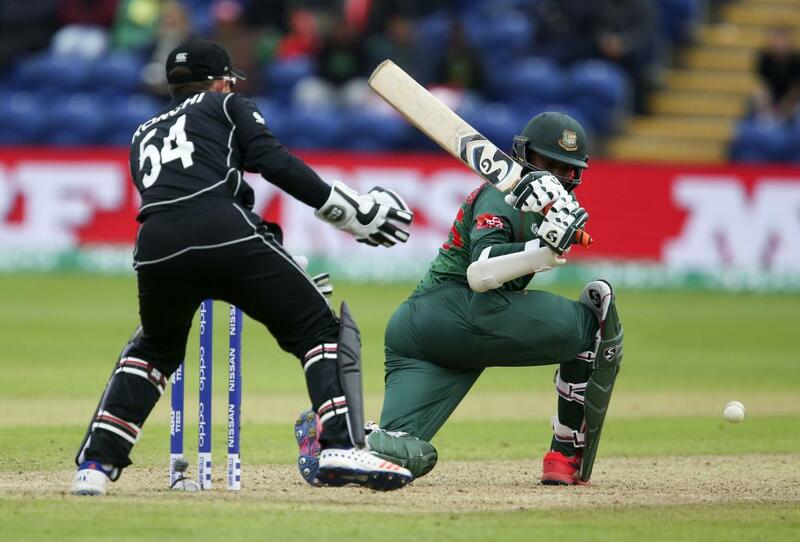 Mushfiqur edges, and Ross Taylor at second slip dives to his left – where first slip really should have been, in the circumstances, but wasn’t – gets both hands to it but only deflects it away for four. That aside, five dots. After 10 overs New Zealand were 60-1. 9th over: Bangladesh 20-3 (Mushfiqur 4, Shakib 2) Southee continues, and Bangladesh still can’t score off him. Two singles, and the required run rate climbs to six. Not impossible, but so far away right now. 8th over: Bangladesh 18-3 (Mushfiqur 3, Shakib 1) Boult, whose four overs have brought seven runs but no wickets. Both batsmen take on shortish deliveries here, but they both pick out fielders and are restricted to singles. 7th over: Bangladesh 15-3 (Mushfiqur 2, Shakib 0) Two fours, two singles and a wide represents the sum total of the encouragement Bangladesh have taken from Southee, while he has taken three wickets. That’s 16 dot balls and three wickets out of 24 deliveries. There are five of those dots here, including a final delivery to Shakib that tempts the batsman into a drive and then whizzes just past the bat. One off the over. 6th over: Bangladesh 14-3 (Mushfiqur 1, Shakib 0) Broom performs another excellent stop at point to save four runs, and then Mushfiqur scoops the last ball into the air in a similar direction, but it lands safe. 5th over: Bangladesh 12-3 (Mushfiqur 0, Shakib 0) Cardiff’s a seam bowler’s playground sometimes, and they’re having a ball at the moment. Southee’s third over is a wicket maiden, and the pressure on the batsmen just isn’t letting up. 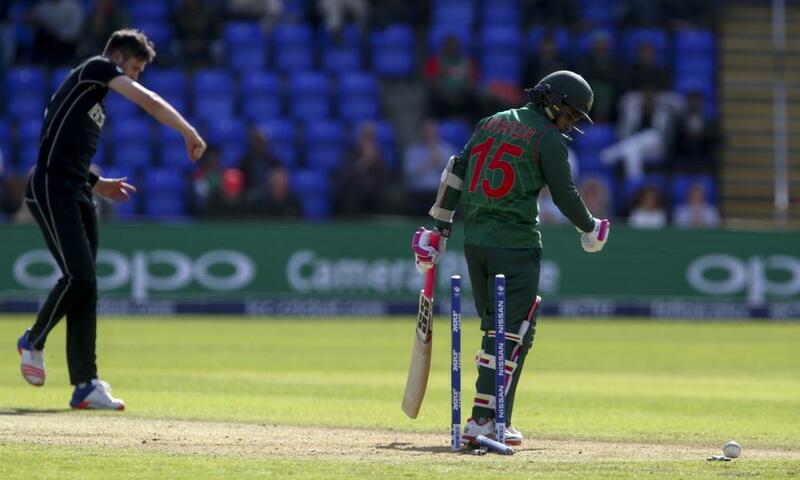 5th over: Bangladesh 12-3 (Mushfiqur 0, Shakib 0) It turns out a review would have saved Soumya, the ball being on its way just over the stumps, but Bangladesh chucked theirs away in the first over and so have to roll with the punches. Of which there are many at the moment, well aimed and reliably vicious. This one cuts back in a long way, and Soumya is bemused, beaten and on his bike! 4th over: Bangladesh 12-2 (Soumya 3, Mushfiqur 0) More drama! 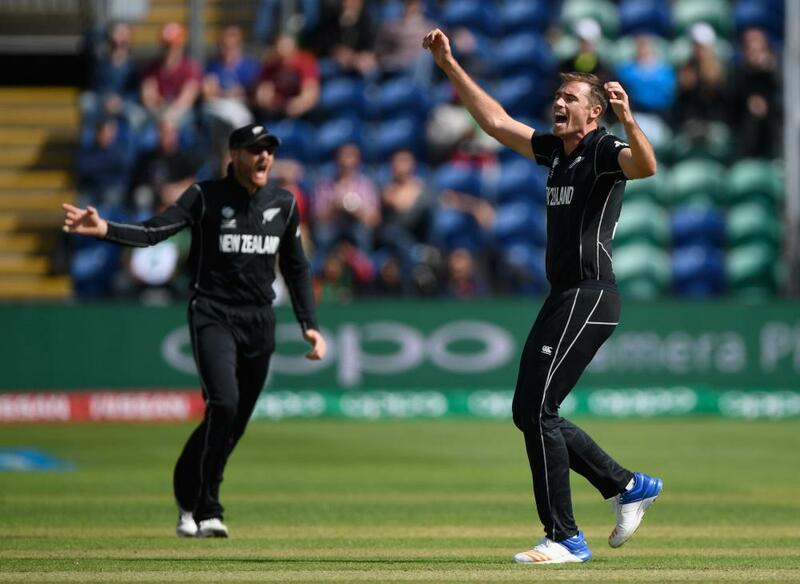 Boult’s first ball is fine but missed the edge, but the second doesn’t – it flies off Soumya’s bat but doesn’t carry to second slip, though an excellent catch, diving forward and to his right, from Guptill gives the umpires a decision to make, which they do with the help of their TV-watching chum. One run off the over, and New Zealand’s bowling has been fabulous so far. 3rd over: Bangladesh 11-2 (Soumya 2, Mushfiqur 0) Southee is causing all sorts of problems, getting a bit of movement, a lot of bounce, and a great deal of batsman-squirm. 266 seems very distant at the moment. Another Southee stonker! Sabbir gets the gentlest of edges, Ronchi claims the catch and the second innings has started just splendidly for the Kiwis! 2nd over: Bangladesh 9-1 (Soumya 1, Sabbir 8) Trent Boult starts with a stonker, angled into the left-handed Soumya and then straightening just past the bat. Soumya then lashes the final ball of the over to point, where it’s excellently stopped one-handed by a diving Broom. 1st over: Bangladesh 8-1 (Soumya 0, Sabbir 8) A lovely delivery for the wicket, straightening past the bat and into the pad on its way to off stump. Sabbir comes in, and his second ball is flicked down leg side for four – New Zealand’s leg slip leaping and whirling in frustration in its wake – and then his second is driven nicely wide of cover. That is plummer than a small plum enveloped in a bigger plum on a giant plum tree. 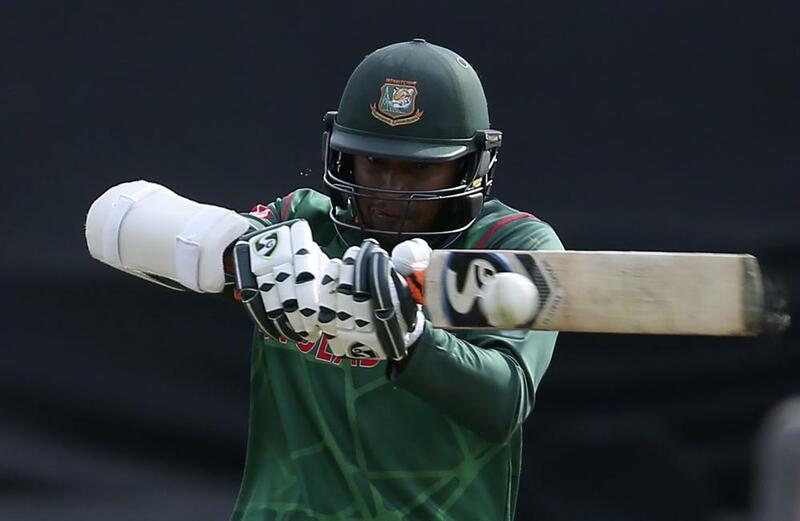 Bangladesh have lost Tamim Iqbal – and their review. Review! Is Tamim Iqbal out second ball? The players are on their way back out, and in a few hours some of them will be out for good, at least as far as the Champions Trophy is concerned. Some excellent death bowling from Bangladesh has left them with an achievable, if not exactly straightforward target. It’s all set up very tastily indeed. Well, they have made a mess of that. 152-2 at 30 overs isn’t anything to get excited about, but it is a foundation that has to generate 300 in the modern game. But at that moment Williamson was ran out for 57, changing the trajectory of this innings. Taylor remained, but was never fluent, his 63 ultimately more noteworthy for the 82 balls it took to get there. Broom and Neesham made starts sown the list, as did Guptill early, but none significant enough or quickly enough to bother Mashrafe’s men. His captaincy was spot on, rewarded on three occasions with wickets as soon as a change was made. Most notably with Mosaddek, brought into the side but not given the ball until over 42. His three wickets in three overs put a dent in the Black Caps just as they needed to find a new gear. It never game. Meanwhile, his quartet of seamers don’t finish with figures that necessarily stand out, but none went for more than a run a ball and all applied pressure at important times. As did Shakib, who raced through his ten on the trot for 52. All told, advantage Bangladesh. And deservedly so. I’ll leave you with Simon Burnton for the chase. Till next time. Be well. 50th over: New Zealand 265-8 (Santner 14, Milne 10). Bangladesh are 15 minutes behind the over rate, but they won’t mind. Southee premeditates a lap to begin the final set. Gets one. Rubel is straight back to the block hole. His figures don’t reflect how well he has gone today. Santner gets another in the hole, digging it to midwicket, leaving Southee the final ball. It’s a shocker, full toss on Southee’s hip that he spin-kicks to fine leg. 4-62 in the final ten overs the final analysis, including eight from the final over. Not ideal. Back in a tic to wrap it up. 49th over: New Zealand 257-8 (Santner 11, Milne 5). Seven from the over, principally due to a Tim Southee clip off his pads, to the rope past square leg. Shot. He retains the strike for the final over of the innings, which will go to Rubel. Class over from Mustafizur, slower balls and quicker balls interchanged, McCullum on TV noting how similar his action is in delivery of them. Good trick to have. NOT OUT. Santner is back with a full dive. Very good throw. Carry on. RUN OUT? We’ll see. They’re upstairs. Direct hit. Stand by. Superb death bowling from Mustafizur, who the TV commentators feel compelled to call “The Fizz” over and over. Fair enough, as he fizzes this yorker through Milne after setting him up with a slower one the ball before it. Middle stump dealt with. “The Fizz is big in The Desh!” adds Nas. Gotta just roll with that one, I guess. 48th over: New Zealand 250-7 (Santner 11, Milne 5). Rubel is brought back for the final two overs from the River Taff End. Mosaddek did nothing wrong of course, but Rubel has been on the mark and quick today. As he is here, beating Santner with a full toss that’s a yard too quick then a yorker that misses by the proverbial coat of paint. Another yorker is speared in at middle and missed as well, but an inside edge saves him. A throw to the Santner end would have done him in too, but it misses. Rubel absolutely brilliant with the penultimate delivery, a yorker tailing away perfectly from the left-hander, giving him very little chance to make contact. One from the over, one ball to come. The all-rounder moves across his stumps and times it well to midwicket for a couple. The 250 is up with the stroke, but only three came from the over. They’re going to be well short what is typically considered par in ODI cricket these days. 21 from the last five overs. 47th over: New Zealand 247-7 (Santner 9, Milne 4). Mashrafe knows the drill here. Keep Milne down there, whatever it takes. A wide begins it, not quite landing the bouncer. And they score off every ball bar one, making seven from the over. But no boundaries, and Milne retains the strike. So that’s a win for Bangladesh.Surely Mosaddek to continue? Also, a set apiece between Muz and Stan over at Roland-Garros in their semi, looking like a third set tie break on the way as well. Check it out game-by-game (no more relentless blog to run than that) with Jacob Steinberg. Related: Andy Murray v Stanislas Wawrinka: French Open semi-final – live! Brilliant! Neesham, in an effort to take the initiative, comes down the track before the ball is bowled. Not so fast, buster. Mosaddek, high on life, spits it down quickly and with the arm, beating Neesham, with Rahim doing the rest behind the stumps. Three wickets in three overs. What a cameo. They’ve lost 4-for-39 and we’re into the NZ bowlers. 46th over: New Zealand 240-7 (Santner 7, Milne 0). 45th over: New Zealand 235-6 (Neesham 22, Santner 3). Only four from Mashrafe’s over, the captain back into the attack at a time where NZ have to delay any final assault as Santner plays himself in a bit. Pace way off the ball too, showing all his experience. Superb cricket. 44th over: New Zealand 231-6 (Neesham 20, Santner 1). You can tell from the urgency in the field that Bangladesh realise they are very close to breaking this open. They will know what Australia did late, and England too. One more, two more. Santner is the new man, a combined young player who is yet to impose himself in this tournament. Few minutes have elapsed since this – they are 52% now, the Tigers. Corey, cory, story, allegory, montessori! First ball Mosaddek has him too! Umpire Llong has him given lbw when he misses a straight one around the wicket. There’s a review but only because you have to in order to keep up appearances in that situation, don’t you? Blimey. What a bowling change! This wasn’t on youtube for a long time, trust me. Mosaddek first ball of a new over, Broom can’t help himself and goes for a frolic down the strip. But gets very little of it, straight into the air it goes, no mistake made. Brilliant bowling change. 43rd over: New Zealand 228-4 (Broom 36, Neesham 18). That’s the over they have been crying out for. Neesham shows sound composure after missing a short ball to begin the over, the ball looking briefly like it would end up back on his stumps. It isn’t a sustainable long-term strategy for Neesham to absorb these short balls so he slaps them instead. Excellent pulled boundary. Ten another down the ground next ball when he goes for the yorker and misses. 12 from it. Neesham in, at least. 42nd over: New Zealand 216-4 (Broom 34, Neesham 8). Michael Clarke-style Funky Captaincy from Mashrafe bringing on offie Mosaddek – back into the XI today – for his first trundle of the day with nine overs remaining. And he immediately beats Neesham’s edge. That has taken off and spat. He’s raced through it too, five from the over. The crowd know how important that is. The last ball is knocked into the deep and two should have probably come if for the full commitment by the deep mid wicket. The way to do it. 41st over: New Zealand 211-4 (Broom 32, Neesham 5). Rubel Hossain. Can I just say again how much I love that little squat he does before exploding at the batsman? Like a pro wrestler about to race at an opponent to spear them to the mat. An improvement for the Kiwis, finding eight from the first of the final ten. Coming after Broom nearly fell to a leading Edge, Neesham cleverly used the pace of the ball to deflect fine for a boundary. Perhaps not in complete control, but you can’t win them all. 40th over: New Zealand 203-4 (Broom 29, Neesham 0). Last over before an extra man can go outside the circle. Bangladesh, it would be reasonable to say, are favourites at this very moment. And England certainly will be tomorrow. In turn, after being 15 minutes from elimination to start the week, well, who knows. Neesham again the recipient of a short ball into, deflecting off his thick pad. Next comes the yorker, at a perfect length but just down the legside. A familar, but effective, routine. Another dot ends the set – just two from it! Neesham not yet off the mark. Well. Ten to go. Taylor, if you were wondering, finishes the group take with 148 runs at a SR of 74. Not very Rainbow Rhythms. 39th over: New Zealand 201-4 (Broom 28, Neesham 0). Predictably, the short ball immediately deployed to Neesham. A perception around the place that he doesn’t like it much. Perhaps a tad unfair given in Australia last year he copped a ball flush on the arm from Pat Cummins and kept batting for a half-century. But he isn’t able to get yet off the mark, the run rate down at an anemic 5.1 an over. Big moment! Taylor, who has been there for a long time but never got motoring, tries to innovate by getting inside the line. But he doesn’t pick the change of pace, well deployed, and can’t make sufficient contact with the scoop. Only suceeds in picking out the man on the 45 inside the circle. Well. Bangladesh are really in this game of cricket, make no mistake. And in turn, the tournament. 38th over: New Zealand 198-3 (Taylor 61, Broom 27). Back to relatively regular programming here, Broom then Taylor happy enough picking the gaps and hitting the sweepers, as they say in the jargon. They’re all slower balls at this stage of the innings, Mustafizur highlighting that he really is a quick of the new generation. 37th over: New Zealand 192-3 (Taylor 58, Broom 25). 11 from it! WILD! Two boundaries! Party on! First, to begin the over, Broom cuts with authority. Don’t bowl there, Taskin. He’s short again to Taylor later in the over, who does as Williamson did earlier in going straight past the bowler. Okay. Now we’re getting somewhere. Apartment block at Lord’s. I know we’ve seen this before, but… yeah? Thoughts? 36th over: New Zealand 181-3 (Taylor 53, Broom 19). Mustafizur replaces Shakib. And the sun is out! First time we’ve seen that for the better part of a week. It doesn’t help NZ though, three more added and Taylor nearly chopping on. It’s broadly under control for the Black Caps still, but they’d want to get a move on soon with wickets in the shed and happy hour nearing. Only four boundaries in 15 overs. I know; hard work. Stick with me. 35th over: New Zealand 178-3 (Taylor 51, Broom 18). Ross Taylor to a half century from the first ball of the over, he 67th he has faced. Easy as so many of the runs he’s taken, to third man. Has a responsibility to go on with it now, though. It’s all a bit stop-start at the moment though, another over short of a run a ball, four singles their fill. 34th over: New Zealand 174-3 (Taylor 49, Broom 16). Not many people in that big grandstand they have at Sophia Gardens. During the Test in 2015 the road of Bread of Heaven really was something, especially when running through Australia in the second dig. Watto’s final stand in Test Cricket. If you’re reading, Big Rig, we miss you. It’s Shakib’s last over, and it gives up a rare boundary when Broom plays late and plays well behind point. Singles elsewhere to take eight from it, finishing his work with the analysis of 10-0-0-52. Won’t be featuring in any highlights packages, but absolutely done the job racing through those overs with a minimum of fuss. 33rd over: New Zealand 166-3 (Taylor 47, Broom 10). Mashrafe wins the leading edge of Broom out to cover but doesn’t go to hand. I know I said he was taking off from Williamson finished, but Mashrafe has him looking unfortable here and unable to get the board ticked over until the last ball, which is in the air through straight mid-wicket. Don’t reckon he had much control over that. We saw them lose 7-37 last week and something similar against England on Tuesday. Two from it. They’re off for a drink, ending a middle session where Bangladesh have consistently prevented NZ from getting away. Nothing special, just attritional cricket. In a world of razzle dazzle, there’s something to be said for that. Latest in the pay dispute in Australia: a summit! Well, wouldn’t that be the event of the year? 32nd over: New Zealand 164-3 (Taylor 46, Broom 9). A legside wide gets the over off to a fine start for NZ before scoring from all but one delivery, Broom starting from where Williamson finished up. 31st over: New Zealand 157-3 (Taylor 44, Broom 5). Broom off the mark with a staight drive from the top drawer off Mashrafe. He times nicely to point as well to put Taylor back down the business end to see out the over. When will he take it up a gear or two? Another run out between these twoin international cricket! Williamson tries to call Taylor through but he wants none of it, he’s short by four metres. Came close to the same outcome to begin the over. Oh that’s inexcusable at this stage, with so much care taken through this quiet period to now take a risk. The captain will know that was his fault too; no way Taylor could have made it. Brilliant from Shakib at the bowlers’ end to pick up the Mossadek throw and move in one transition to the stumps. Exactly the same point of the innings that Williamson fell against England too. Two in three Champs Trophy innings run out. 29th over: New Zealand 148-2 (Williamson 57, Taylor 40). The skipper Mashrafe brings himself back and it is a very tidy over, five dots within. The best of those, rolling his fingers down the seam and beating Williamson who is well through his stroke, a fan inside edge spilling out. 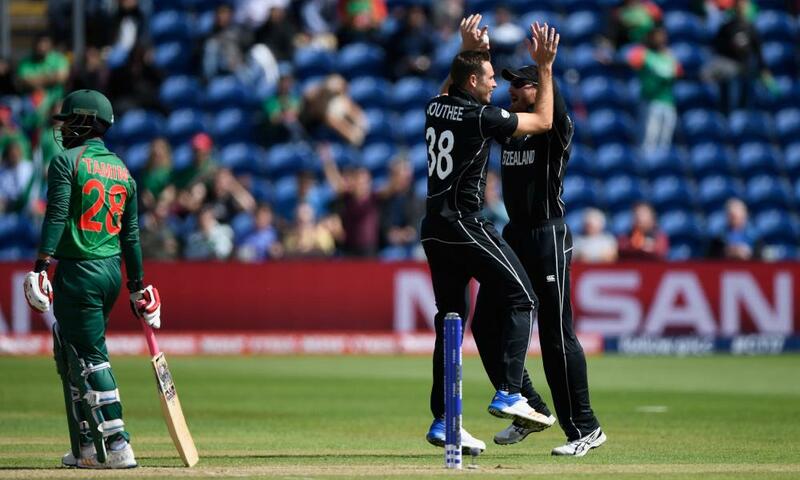 28th over: New Zealand 147-2 (Williamson 57, Taylor 39). Shakib gets through another of these 75 second wonders, shedding only three runs. That’s 33 from his seven. At the end of the set, a commentator (Nasser, I think) informs us that you can “double your score at 30” if wickets are in hand to work out the final score in an ODI. Who knew? (Sorry). 27th over: New Zealand 144-2 (Williamson 56, Taylor 37). Rubel again. He does this yoga-style squad before charging in to bowl each delivery, a run up no longer than Mark Wood. 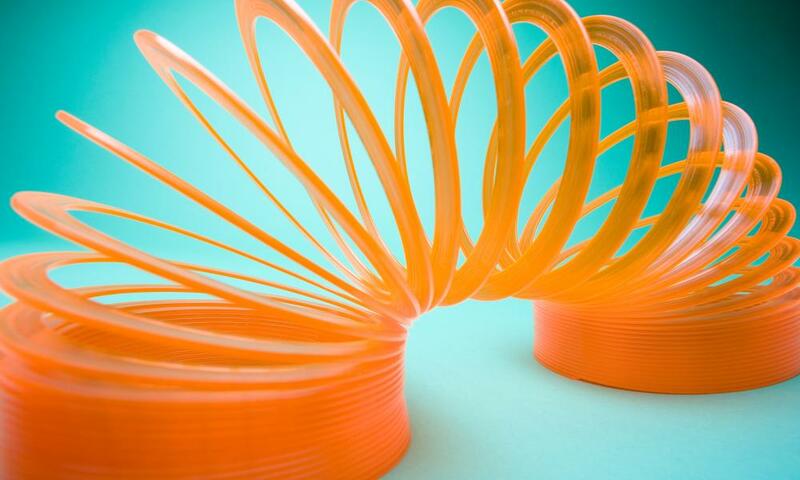 Slingy, slippery, joyous. But not overly threatening to either of these experience campaigners here. Milking, using his pace to take six more. 26th over: New Zealand 134-2 (Williamson 52, Taylor 35). Shakib races through another quick set where four are taken through the field to the sweepers. Nine hundreds and seven 90s for Williamson in his 100-odd ODIs, TV reminds me. Gotta go the whole way here. Huuuuge game tomorrow for my countrymen. Win, they stick around. Lose, on QF2 at dinner time Sunday. Plenty going on off the field as well as England try to knock them out. My preview. 25th over: New Zealand 134-2 (Williamson 50, Taylor 33). Rubel, comfortably the best of the Bangladesh bowlers so far, back into the attack. An eventful over proceeds. He gets one to spit at Williamson, the NZ captain able to keep it down in steering to third man. Have another half-century, Kane. A combination of beautiful strokes and less convincing moments, beaten far more often than we are accustomed with him. Later in the over, Taylor plays a flat-batted pull shot that you can imagine seeing Steve Smith play when chasing second innings declaration runs. Finds the gap though, and into the 30s he goes. To conclude, a mix-up! Heads literally clash between the batsmen, but they have enough awareness to scamper back to where they need to be to avoid any run out. That’s how Williamson went in Birmingham a week ago – albeit on 100 at the time. Eight from it. And we’re half way there! 24th over: New Zealand 126-2 (Williamson 48, Taylor 27). Carbon copy of the Shakib over that he’s been rolling out from when he came into the attack, prompting Taylor to come down the track to take the initiative. No freebies here. Four from it. Few brower issues by the way, back to more verbose updates in a tic. 23rd over: New Zealand 122-2 (Williamson 45, Taylor 26). Mustafizur gives Williamson a chance to pounce, width and time he doesn’t miss out on, straight past the bowler too. Much harder to do than it looks. 22nd over: New Zealand 116-2 (Williamson 40, Taylor 25). Excellent bowling from Shakib, mixing accurate darts with hard-spun variety. Both men use their feet to turn the strike over early in the over, with two more singles to end the over on the legside. The last five overs worth only 18, no boundaries to speak of. 21st over: New Zealand 112-2 (Williamson 38, Taylor 23). Absolutely belt and braces here. Three singles from Mustafizur. NZ happy to lay the base, nothing more. Bangladesh happy to go at fewer than a run a ball. Everyone wins. 20th over: New Zealand 109-2 (Williamson 37, Taylor 21). Shakib al Hasan. The sort of name you just feel the need to say in full rather each time it appears. He has an important role here keeping Williamson on the leash. Singles to long off, midwicket, fine leg and cover. Quiet, patient accumulation. The PM is formally the PM after a trip to Buckingham Palace, if the cricket is your one and only focus at the moment. Not the most enthusiastic speech, if twitter is to be believed. 19th over: New Zealand 105-2 (Williamson 35, Taylor 19). Mustafizur is back. Battled earlier for consistency, but his numbers don’t lie, he can be a matchwinner. Williamson has his measure right away though, his best stroke for some time, a beautiful cover drive. The 100 up in the process. Taylor more circumspect, happy absorb four dots on the trot. 18th over: New Zealand 99-2 (Williamson 30, Taylor 19). Two HUGE shouts for lbw from Shakib. He’s absolutely leading with Umpire Llong, who isn’t interested on either occasion. The first of those actually went to the rope, a sweep shot that the replay shows hit the full face of the bat. Eight come from it. John Starbuck on the email wants to confirmation that the game is 50 overs apiece. That it is. You only start to lose time after 75 minutes has been lost, if I recall correctly. 17th over: New Zealand 91-2 (Williamson 28, Taylor 13). Rubel’s fourth over here. Four more singles, ranging from the thrid man dab to the push through midwicket. Both players too experienced here to do anything either than knock it around for now. Essential that New Zealand don’t expose their faltering lower-order quite yet. 16th over: New Zealand 87-2 (Williamson 26, Taylor 11). Spin for the first time today, courtesy of Shakib al Hasan, the world no. 1 all-rounder. You see, I’m obliged to say that every time he enters the game. It’s a rule. Every commentator, every forum, every time he plays. The left arm ortho has six risk-free runs taken from his opening set as we enter the accumulation phase. 15th over: New Zealand 81-2 (Williamson 21, Taylor 8). Rubel gets the last over before they have a little drink. Singles past point for both to begin. Calm. Length back, Williamson joins deeper in the crease but then cops one in the thigh pad. Oh and some superb bowling to finish the session, beating the outside edge now. Rubel with that feisty little run up has got it darting around both ways. Kane far from his most fluent, but still there. Proper battle. 14th over: New Zealand 79-2 (Williamson 21, Taylor 8). Taskin to Taylor. Neither giving an inch, the former bending his back, the latter leaving then defending as he gets in. But to the last two balls, he’s ready to roll. First, a graceful drive down the ground. Lovely way to get off the mark. Then he repeats it! Down the ground again, a half-volley, but you’ve still gotta put them away. Beautiful. Vampire Weekend on the Cricket Ground PA system between overs. Lovely areas, Sophia Gardens DJ. No second invitation required for me to do the same. Make sure next time Vish is on the OBO you all pester him to tell you his Vampire Weekend story. I won’t steal his yarn. Specifically: ask him why he has an mix-tape that Ezra Koenig compiled in his house. Not a CD, a tape. 13th over: New Zealand 70-2 (Williamson 20, Taylor 0). Was going pretty well earlier in the over when Williamson leapt on an overpitched Rubel delivery on his pads, down to long-on for a boundary. Doesn’t miss out there, the Kiwi captain. Ross Taylor the new man in, getting a wide bouncer first up, getting underneath it. These two for the briefest time had the Black Caps in the chase against England, requiring 155 with 20 overs to go. Related: County cricket: Surrey v Essex, Somerset v Yorkshire and more – live! Oh yes! That’s what fast bowlers dream of late at night, Rubel getting that to career back into the pads of Guptill, who is late on it and hit adjacent. He considers a review, but that wouldn’t be a good idea as it looks to be crashing into middle stump. Reward for an excellent period for Bangladesh. The crowd are up and about as well. 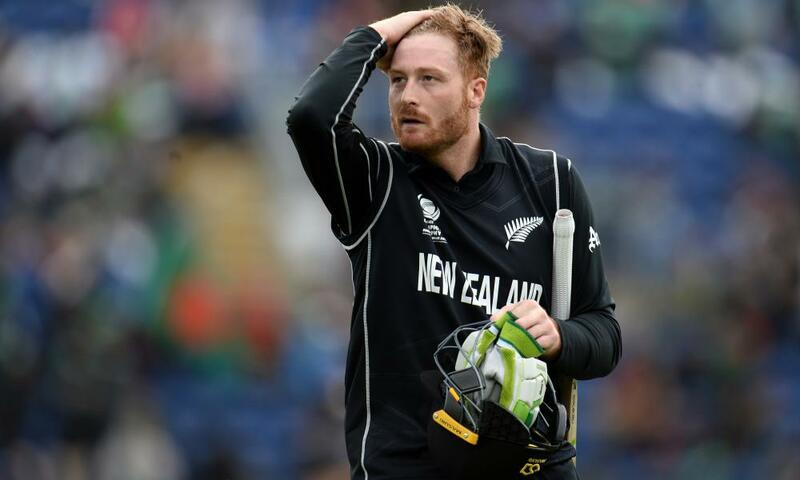 12th over: New Zealand 62-1 (Guptill 33, Williamson 13). Very tidy little period for Bangladesh’s change seamers. Taskin, already in the book, is bending his back and getting ample reward. This over that includes beaten Williamson’s outside edge – again. To be fair, it has done plenty. Also crashing into his pad. The lbw shout is quickly turned down but the pace is what matters there. The final ball Williamson retains the strike, but from an inside edge as well. 11th over: New Zealand 61-1 (Guptill 33, Williamson 13). Rubel Hossain, who you may remember as the man who had England eliminated from the 2015 World Cup with a bag in Adelaide, is into the attack. And he wins Williamson’s edge! The only run of the over. Twice beaten out there and now a legitimate snick to second slip, but no man in there. It’s a feisty over too, getting up in Guptill’s grill by the end of it. Good contest, here. A note from Andrew Benton on the twitter. “Adam, that’s one great hairdo – did you come straight out of the ‘60s?” Thanks for noticing, Andrew. As I don’t mind telling people, it’s the best Barnet in London. “I say B’desh will blooter NZ today.” Blooter. I’m thieving that. Productive correspondence. Thank you. 10th over: New Zealand 60-1 (Guptill 33, Williamson 11). Williamson beaten for a second time! You don’t see this very often. Almost identical to the over before, on the back foot. It comes the ball after he drives with typical class down the ground to the rope, taking advantage of the field restrictions that come to an end with this over, the power play netting the Black Caps an even run a ball. Sound. Oh! Anyone else hear that on the TV? Sky accidentally cut to the producer’s mic between overs rather than the commentators. I have fellow OBO-er Nick Miller sitting opposite me who asks: “Did he call any of the commentators dicks?” Sadly not. As he says: “Missed opportunity, then.” That it is. Reported that day after the Brexit Debacle last year he took himself off to Earn Spencer’s gaff in Northampton for a hit. As you do. 9th over: New Zealand 54-1 (Guptill 32, Williamson 6). Hiiiii Kane. Mashrafe, into his fifth over, hits that fourth stump line. Williamson, deep in the crease and on the balls of his feet, times it to the rope. Not the swing of a cut, nor the jolt of a punch. Have it. Proving he is human though, tries it on again to end the over and beaten outside the off-stump with one that swings away. Good bowling. The 50 up in that over as well. Want to read the best of the Guardian Sport’s offering each week? A pretty competitive field with the writers who swan about this joint, so I can only commend this curated offering as an excellent use of your time. An email, from HQ to you, every Friday morning. Sign up for free to The Recap here. 8th over: New Zealand 48-1 (Guptill 31, Williamson 1). Welcome, Kane. Hi Kane. You little gem. You prince. You gorgeous thing. Stay a while? Off the mark with a little dab to third man. All the time in the world. I’ll end up saying that a fair bit. More from Simon. It’s the man of the hour, Jezza. What’s he about to roll out there? A little ortho? Out the back of the hand? Some frog-in-blenders? I do hope his next stanza as Opposition Leader allows us to find out. Ronchi has completely mishit that, beaten by the extra yarn Taskin has I suspect. Instead of clobbering over midwicket, it is high off the splice and into the hands of mid-on. I know it’s early, but the Tigers needed that. 7th over: New Zealand 46-0 (Guptill 30, Ronchi 16). Mashrafe again taken over cover by Guptill to start the over. Only for four this time, mind. He started well but has lost his line now, four of the six balls scored off. NZ away here, I reckon. 6th over: New Zealand 38-0 (Guptill 25, Ronchi 13). The quick man Taskin into the attack replacing Mustafizur. Into the XI today for the spinner Mehedi. He’s good, then bad. Ronchi is the other way, swinging without footwork, then smashing a drive on the up in glorious fashion. More Hawkey? His 1984 re-election was seriously effected by hooking a bouncer onto his glasses in the annual Policians v Press game. A lot of damage and bruising and the like. Great fixture, that. Managed to stitch together quick half-centuries in my first two years in the Policians XI. Did more for my rep around the parliament than anything I did at work. Back to Hawke. Has fit more into his life than most would in ten or more, the PM between 1983-91 among other things. But says one of his greatest regrets is missing out on a Blue for cricket when at Oxford in the mid-1950s. He did, infamously, set the World Record for skoling a yard glass while studying there though (11 seconds). A party trick he still gets involved with annually at the SCG now despite being nearly 90. Never change, Bob. 5th over: New Zealand 31-0 (Guptill 24, Ronchi 7). Boom, boom! No, Boris Becker isn’t here, it’s the other red head Marty Guptill. Through the line to the first delivery he literally pops Mashrafe into the bloody river! As you do. Once they fetch a new one from the box of balls, he sits back and crunches him to the rope along the carpet through cover. That’s one way to break up a bowler’s momentum after picking up a maiden in the previous set. Things calm down a bit thereafter, only a further single down the ground. The first of Simon Bogli’s cricket/politics series below. Featuring non other than Robert James Lee Hawke! 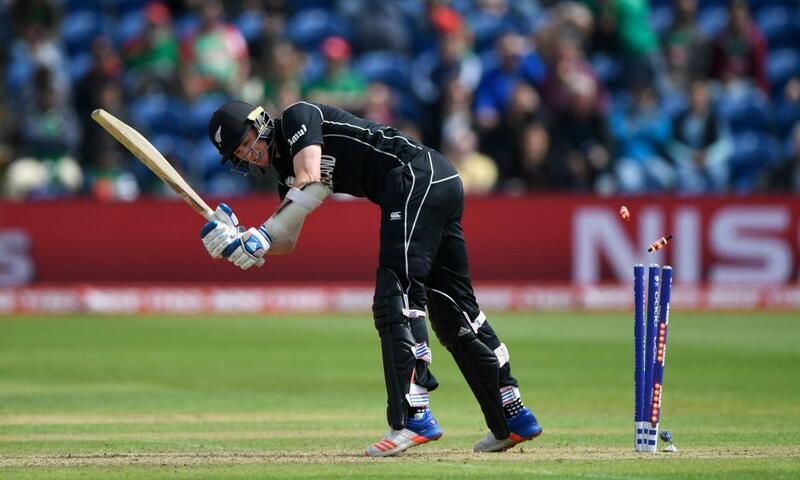 4th over: New Zealand 20-0 (Guptill 13, Ronchi 7). Singles to each of them to begin the over, Ronchi off the mark in the process. Mustafizur then sends one racing past the ‘keeper/bat’s outside edge. Superb bowling. “He’s learned from his mistake,” says Nas. “After the first couple of deliveries he’s pulled his length back.” An false-kinda stroke from Ronchi follows, shovelling over midwicket. Then again, he’s never been conventional and won’t be changing now deep into his 30s. But just as we’ve talked him up, Mustafizur gives Ronchi some help-yourself stuff well wide off off-stump and short, the batsman lashing it over gully for his first boundary of the day. 3rd over: New Zealand 12-0 (Guptill 12, Ronchi 0). Mashrafe has Guptill neither forward nor back a couple of times here. He picks out a fielder with a forceful punch last ball of the set, which secures him a maiden. Very good start from the veteran. Some footage from the last time he played here? Why not. Shoulda gone / invaded the ground. 2nd over: New Zealand 12-0 (Guptill 12, Ronchi 0). Mustafizur begins from the River Taff End. Not 100% sure what end he’s bowling from to be honest, but I know there’s a River Taff End at Sophia Gardens, so we’ll go with that. Guptill strikes consecutive boundaries to begin the over. The first isn’t that convincing, squirted through point. The next is struck better. Mashrafe takes out his slip. The bowler comes straighter, worked for three through midwicket. So that’s 11 in half an hour. Not ideal for the 21-year-old left-arm whippet. Ronchi happy to watch the rest. 1st over: New Zealand 1-0 (Guptill 1, Ronchi 0). Mashrafe the skipper opening the attack. Twitter suggests a small crowd, but the Bangladesh fans are making plenty of noise. They were magnificent at The Oval the other night. Down the legside to begin, but they appeal anyway. Marty G is peeved that he didn’t get a legside wide for it. Mashrafe is on the mark shortly thereafter. Good start. Wins an edge that probably wouldn’t have carried to third slip, but encouraging. Actually, cancel that: second slip, and it would have carried. No one to blame but himself for not having a more aggressive field in place. He’s due, Marty. I spoke to him before the tourney about averaging 50 and striking at 100 since Baz McCullum retired. Quite the purple patch. But yet to really fire a shot here. Lovely man, and gives it a wallop. Entertain us. An excellent email. If you’re new to these wondrous parts, the OBO works best when you talk to me, then I talk to you via my posts. Simon Bogli has come correct with an epic email titled “cricket and politics.” Tons to pick through. And let me use them one at a time. I’m pretty sure you’ve bunged a youtube clip at the bottom with Kevin Rudd where I feature. Nice touch, Simon. Nice touch. Back with more of that soon though, as the players are on the field. Blink and you miss it. But yes, I’m there. Anthems! Bangladesh’s is up there with Sri Lanka’s and American Pie for length. Admire that. Builds the anticipation for God Defend New Zealand, which is objectively the best, surely? Anyone care to suggest an alternative? If so, please include evidence via youtube link, preferably with rugby players crying as they belt it out. The teams, in picture form. Mehedi is the second man out for Bangladesh. Barely got a jam roll the other night – stiff! Mosaddek in for him. New Zealand have won the toss and are batting! Nasser talking to the skippers. Kane Williamson says they “learned a little bit” from the other day. And despite the grass on top, it remains dry. They’re going in with the same XI as Tuesday when they were well beaten by England. “It’s been a pretty amazing tournament,” Kane adds. Easy to please, then. Mashrafe says they would have bowled anyway. They’re dropped Imrul for Taskin; a bat for a quick. As for the other change, when asked, he said “someone else” is in. Love this bloke. Both teams as named as soon as we get the sheets. Good news! Toss in five minutes! Play to begin at 11:30am. No overs lost. Get in. If you’re mesmerised by the Sky highlights. And haven’t switched back over to the election during the rain. Sources reporting to The Guardian that the DUP will join a minority government with the Tories, PM May to see the Queen at lunchtime to confirm the tryst. Having been involved in one of those bad boys in Australia between 2010-2013, all I can say is g’luck with that! Let us know how you get on! Keep a tab open for both blogs. Our OBO colleague, and the man I spend rougly 15 hours a day talking absolute trash at, Vithushan Ehantharajah, did a series of tip top election/cricket funnies last night. Indulge. Do one yourself. Go wild. Reminded of this article. When chatting to All Out Cricket’s Phil Walker who’s commentating today’s game over at TalkSport. Every batting verb the great man Jim Maxwell has ever used in his 43 year career behind the mic on the ABC. It’s sunny in Cardiff. So twitter tells me. Don’t know about you, but I’m getting a bit sick of having all the expensive drainage under control, but cannot cover enough of the playing area to prevent lengthy delays after rain has stopped. I had a bit of a rant about this the other night in relation to the fact that we can’t get back on when it is drizzling; the playing condition still that it has to come to a complete stop. I don’t want to start this on a negative note, but you know what I’m saying. I’m not saying we need to do it as they do in Sri Lanka. But we put man on the Moon. Quite a few times, in fact. We’re going to have insane colonies on Mars by the end of the century according to this very interesting article. Yet, yet, yet. I neglected to tell you how we can chat. Well, there’s the email for your considered words. And the twitter machine for your nonsense and Corbyn photoshopping. Pretty happy with either. Good morning to you all from Guardian HQ in London. Not sure about you, but I’m operating off the minimum hours sleep required to function as a proper human after the election night that was. Those who recall my OBO from last year’s Australian election day will anticipate a healthy dollop of that as we progress through the morning. Oh, neglected to mention, it’s Adam Collins here on the OBO ones and twos. Hello. Righto. The game ahead of is New Zealand and Bangladesh, the ninth of Champions Trophy 2017 and the final pool rubber for both of these teams. The equation is simple: the winner stays alive. For 24 hours at least. If Australia win tomorrow, this will have been a retrospective dead rubber. But seeing as we haven’t found a way to travel through time yet (AND WHY NOT? ), neither side know that now. Like all teams in Pool A, apart from England, these two have been involved in washouts. The Black Caps were stitched up this time last week, well ahead in their opener against Australia before it chucked it down. As for Bangladesh, also against Australia on Monday, they were on their way to a guaranteed early flight home before some trivial delays became more serious. In essence, they were saved by four overs. So they arrive in Cardiff with hope. False perhaps, but hope. Oh, speaking of Cardiff. This is the first time Bangladesh have been back since they knocked off Australia in 2005. What a time to be alive that was? My first day in the UK for that particular cricket season as a naive 20 year old. I asked Mashrafe Mortaza, the only active Tiger in the current XI who played that day, about the win. He remembered two things. Trapping Adam Gilchrist second ball of the day (he finished with 1-33 from his ten). And that they hired a limousine to go out on the town afterwards. Beautiful, isn’t it? He’s no longer the attack leader, that job is 21-year-old Mustafizur. He takes his wickets at 17 and bowls fast. A lot to like. With a fresh track at Cardiff today, it will suit his stylings. Regrettably, I can report that it will be a delayed start due to, you guessed it, rain. But the TV crew are out in the middle without umbrellas, so it shouldn’t take long to get the show on the road. Back to Bangladesh, they rely on Tamim Iqbal to make the bulk of their runs, and he’s delivered with 128 against England and 95 taking on Austalia’s seriously quick pace attack. Not for nothing. He also made matchwinning runs against the Kiwis in Ireland during their warm up series, splitting that one-all. Last year, New Zealand turned them over three-nil, though. For the lads from the land of the long white cloud, Kane Williamson is batting like a prince at the moment. Standard. A ton against Australia, only removed when ran out. Then 80-odd against England, ended by a Mark Wood snorter. They are due a Martin Guptill frolic. He’s ranked seven in the world at the moment in ODI batting tables but is yet to fire a proper shot. Trent Boult and Tim Southee with the ball will also like the overcast conditions. More news as I end this rambling preamble: it looks like we will be waiting for an hour before play. Weird given it doesn’t look to be raining. I’ll keep an eye on that. But we’ll have fun anyway, won’t we? Obvious musical starting point for the day. The Reverend David Warner, as he is now known by his Australia team-mates, has pointed to his late-night swing at Joe Root in Birmingham’s Walkabout bar four years ago as the turning point in his career, one that has led to him becoming the most feared of openers on the field while transforming him into a mild family man off it. The meeting on Saturday between Australia and England at Edgbaston – a match Steve Smith’s side likely need to win to join their opponents in the Champions Trophy semi-finals – was always going to lead to Warner’s infamous punch being revisited. It came after the corresponding fixture in 2013, resulting in his banishment from the start of the Ashes series that summer. Now 30, married with two young children and teetotal to boot, Warner looks back at that night as the making of him, with the numbers since certainly supporting the theory given that 26 of his 31 international centuries have come since the Walkabout incident.